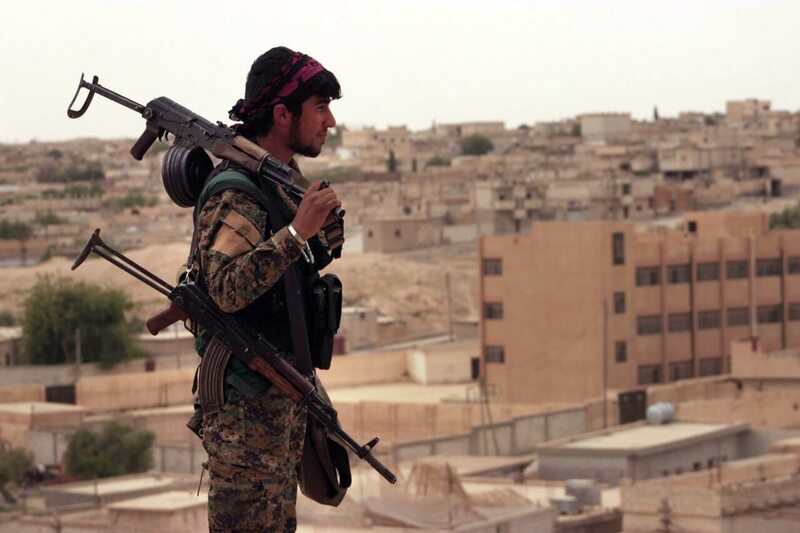 WASHINGTON — Syrian Kurdish fighters are newly armed with sophisticated American combat equipment as they close in on the Islamic State's stronghold in Raqqa, Military Times has learned, weaponry the Pentagon says it is barred from providing to those forces. The gear includes U.S.-manufactured night-vision goggles, rifles and advanced optics among other items, the same as that used by American special operations forces and the foreign commando units they train. In northern Syria, where about 900 American advisers are supporting separate coalitions comprising thousands of Kurdish and Arab conscripts, it's been fielded by the People's Protection Unit. The militia, widely known as the YPG, has emerged as the U.S. military's most trustworthy and capable proxy on the ground. The development is likely to infuriate Turkey, which considers the YPG a terrorist group, and could prove problematic for President Donald Trump and his national security team. Like its predecessor, the Trump administration is struggling to balance a tenuous relationship with the assorted factions Washington has assembled in its complex effort to destroy ISIS, bring stability to the region and safeguard allies who will remain vulnerable when U.S. military forces eventually withdraw from the war-torn country. While the Pentagon acknowledges arming some allies inside Syria, typically with AK-47 assault rifles and other basic Russian-made weapons, U.S. military officials denied providing anything to the YPG and offered only ambiguous responses when asked by Military Times how such sensitive equipment was obtained by the group’s commando force, called Yekineyen Anti-terror, or YAT. It was likely funneled to them through "other means by other sources," a defense official said, insisting on anonymity because the matter remains fraught with diplomatic implications. There are an estimated 40,000 YPG fightersin northern Syria. The elite YAT is believed in number in the hundreds, though it's unclear precisely how large the secretive commando force is. Washington's relationship with the Kurds is complicated by Ankara’s insistence they are a militant Syrian arm of the PKK, an internationally designated terrorist organization responsible for numerous deadly attacks inside Turkey dating back decades. The Turkish government wants the YPG destroyed and bitterly resents any effort to enable the group's combat capabilities. This dynamic has fractured relations between the NATO allies, prompting threats against U.S. troopswho in recent days were rushed to the Syria-Turkey border as part of a desperate effort to prevent Turkish forces from targeting YPG fighters and further delaying a planned siege on Raqqa, the Islamic State’s de facto capital. Despite its potential to worsen fallout between the U.S. and Turkey, the Kurds' access to sophisticated American weaponry sheds new light on the Pentagon's near-term plans for destroying ISIS. It also highlights a potential long-term strategy for establishing a semi-autonomous region in northern Syria where U.S. allies can have a safe haven from Syrian President Bashar al-Assad and forces loyal to his regime. Photos of YPG commandos brandishing American gear first appeared on social media in late March, during a U.S.-backed mission to liberate Tabqa, a town west of Raqqa where ISIS has launched attacks and stockpiled weapons. 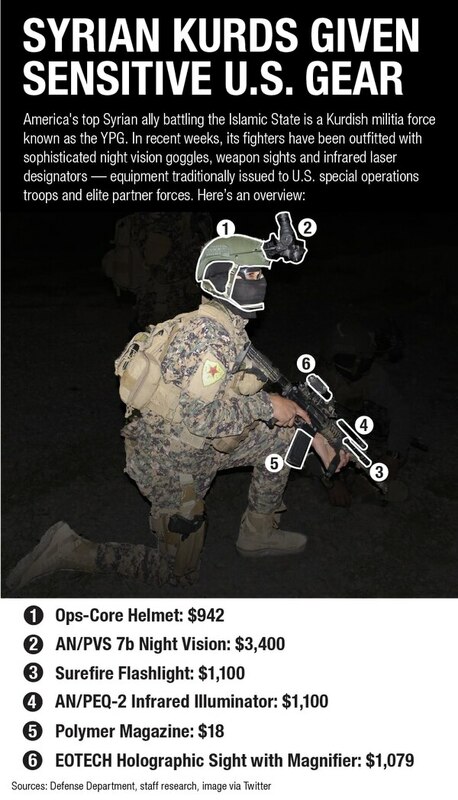 The images depict a YPG unit outfitted with clothing, weapons and enhancements once issued to U.S. Marine Corps special operations personnel but subsequently phased out as the Pentagon procured newer and better products. The items include advanced combat helmets, digital camouflage uniforms, Patagonia cold-weather attire, chest rigs that hold ammunition, body armor and first-aid kits, plus M4 rifles with various modifications, including infrared lasers used for targeting during nighttime raids. Taken together, this ensemble makes the YPG more lethal and offers greater protection. "Basically, if I can move, shoot and communicate at night far more effectively than you can, I have a significant advantage over you." said Adam Routh, a defense expert at the Center for New American Security, a Washington think-tank. Routh served in Army special operations with the 75th Ranger Regiment and deployed to Afghanistan several times. Indeed, YPG commandos now bear strong similarities to other American-trained foreign special forces, including those in Afghanistan, Iraq and Tunisia, suggesting a deliberate intent to equip and enable the Syrian Kurds to hold their own against terror groups and regional adversaries. The U.S. is authorized to sell night vision equipment only to approved states, not militia groups. Defense officials who spoke to Military Times suggested there are myriad ways this equipment could have been acquired by the YPG, including through the black market. It’s also possible, officials said, that the gear was stolen when Iraqi military facilities fell to ISIS beginning in 2014. Though the Pentagon says it’s prohibitedfrom arming the YPG, there are no such restrictions on the CIA or the U.S. military’s Joint Special Operations Command, said Seth Binder, who researches security assistance and U.S. arms deals at the Center for International Policy in Washington. JSOC, like the CIA, is a clandestine organization that can function under Title 50 of the U.S. Code and conduct covert operations in the interest of U.S. national security. A prime example is the 2011 Navy SEAL raid in Pakistan that killed al-Qaida founder and 9/11 mastermind Osama bin Laden. The CIA declined to address questions from Military Times. A spokeswoman for U.S. Special Operations Command, which oversees JSOC, confirmed that some American-made rifle optics and visible lasers have been provided to other Syrian rebel groups, though she declined to specify any particular organizations. Lt. Cmdr. Lara Bollinger told Military Times that those products include a scoped optic that special operators commonly call an ELCAN, an EOTech holographic sight and the AN/PEQ 5 visible laser. SOCOM has not provided night-vision technology or infrared lasers to any Syrian rebels, Bollinger said. Military Times spoke with two westerners who have volunteered to fight alongside Kurdish forces in Syria and Iraq. Each suggested the YPG may have obtained night vision and other sensitive American weaponry through non-NATO countries authorized to buy it. One prominent example is Ukraine, which continues to battle Russian-backed separatists in a bloody conflict that’s put much of Eastern Europe on edge. It’s possible, one westerner said, that the gear is smuggled into Syria via Iraqi Kurdish forces who’ve backed the YPG in past battles with ISIS. The Pentagon disputes that claim. "The Department of Defense does not provide weapons to the YPG, directly or via intermediaries. We have no indications that Iraqi Peshmerga forces have transferred U.S. equipment to the YPG," said Maj. Adrian Rankine-Galloway, a Pentagon spokesman.The Peshmerga are the military forces of the autonomous region of Iraqi Kurdistan. Afghan commandos from 3rd Company, 7th Special Operations Kandak maintain security during full mission rehearsals in Washer district, Helmand province, Afghanistan, Feb. 27, 2013. Nevertheless, that the YPG now has a well-equipped counter-terrorism force fits a well-established pattern among other fledgling U.S. allies battling ISIS, alQaida and and their numerous affiliates throughout the Middle East and Africa. It also dovetails with the Pentagon’s broader strategy for enabling local forces to take charge of their own security. In Afghanistan, for instance, Afghan commandos sport older generation night vision goggles and M4 carbines augmented with scoped optics and infrared lasers. 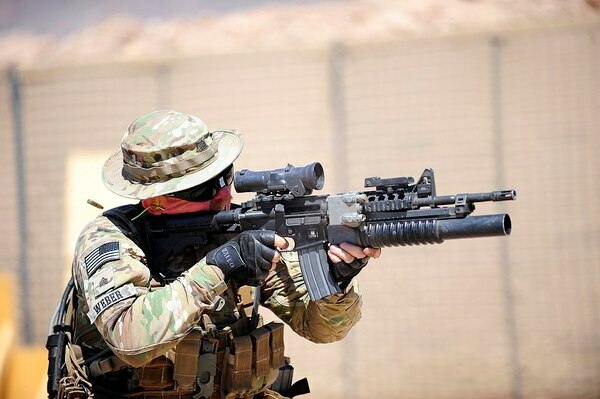 The Iraqi government's counter-terrorism force, known as its Golden Division, wears U.S. night vision and body armor, and carries M4s with scoped sights and infrared lasers for nighttime operations. 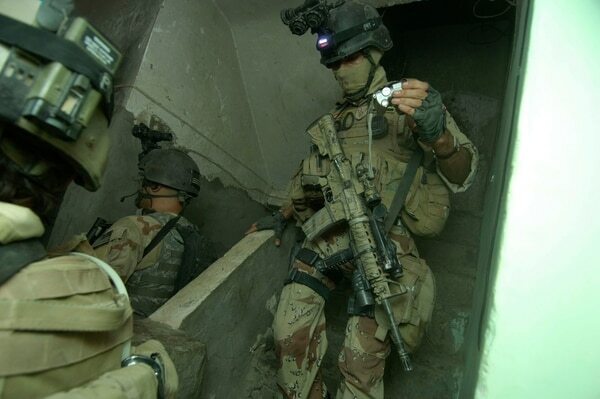 Iraqi Special Operations Forces advised by U.S. Special Forces finish clearing a house during a combat operation to detain suspected terrorist leaders of an insurgent force in support of Operation Iraqi Freedom in Baghdad, Iraq, on Aug 13. In northern Iraq, a Peshmerga special forces unit, the Lexoman Parastin, which is trained and equipped by U.S. special forces, is largely indistinguishable from other Western commando units both in the tactics they employ and the equipment they carry. The Lexoman Parastin is rumored to be training the YPG, and it’s believed they assisted with the March air assault in Tabqa. With the Islamic State’s defeat appearing imminent, key stakeholders in Syria are beginning to discuss what comes next. Trump has engaged with Russian President Vladimir Putin, who backs Assad, over the possible creation of safe zones, or de-escalation zones, to promote peace and protect the various warring parties. In northern Syria, one major obstacle is the need for a well-trained force capable of holding territory, said Routh, with the Center for New American Security. The YPG — with its well-armed, equipped and trained commandos — provides the necessary components to carve out a safe zone, he suggested. It is difficult and time-consuming to build and train allied forces into competent commando units, Routh noted, indicating a strong possibility that a more capable and potent state actor is behind the YPG’s development. For perspective, Routh added, Iraqi special forces spend about 18 months in training, a good portion of which is with coalition support. "The U.S. has invested in both training and developing some of these local commando forces," he said, "which means the U.S. is likely to use them for safe zones."